This weekend brings us the return of the famous Leonid meteor shower, a meteor display that has brought great anticipation and excitement to night sky watchers around the world. This will be a favorable year to look for the Leonid meteor shower because the moon will be only crescent and will have set in the west long before the constellation Leo begins to rise into the night sky. The Leonids appear to radiate out of Leo (hence their name), and with the moon out of the sky completely, viewing conditions could be perfect for stargazers with clear weather and dark skies. View Vaubaillon’s depiction of Earth’s track through the meteor stream. View Maslov’s website on the 2012 Leonids here. For example: Sometime around 1 a.m. EST (0600 GMT), the Earth may interact with material that was shed by comet Tempel-Tuttle back in the year 1400. But at best, only about 15 to20 Leonids per hour may be seen. 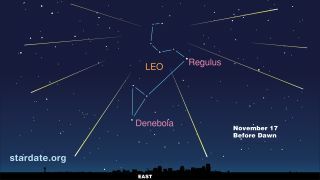 The meteor shower will appear to emanate from out of the so-called "Sickle" of Leo, but prospective viewers should not concentrate on that area of the sky around Leo, but rather keep their eyes moving around to different parts of the sky. It is best to bundle up warmly again the chill of mid-November night and to lie down on a lawn chair wrapped inside a blanket or observe from the comfort of a sleeping bag. A thermos of a hot beverage such as coffee, tea or soup makes a good companion. Because Leo does not start coming fully into view until the after midnight hours, that will be the best time to concentrate on looking for the Leonid meteors. The hours after midnight are generally best for watching for "shooting stars" anyway, because before midnight we are riding on the back side of the Earth in its orbit around the sun, whereas after midnight we are on the front or advancing side. After midnight the only meteoroids escaping collision are those ahead of the Earth and moving in the same direction with velocities exceeding 18.5 miles per second. All others we will either overtake or meet head-on. But before midnight, when we are on the backside, the only meteoroids we encounter are those with velocities high enough to overtake the Earth. Therefore, on the average, morning meteors appear brighter and faster than those we see in the evening. And because the Leonids are moving along in their orbit around the sun in a direction opposite to that of Earth, they slam into our atmosphere nearly head-on, resulting in the fastest meteor velocities possible: 45 miles (72 kilometers) per second. Such speeds tend to produce bright meteors, which leave long-lasting streaks or trains in their wake.